It was always going to be difficult to deny the rampant Tigers an eighth successive win, though Fylde gave a flat display and were unable to take the initiative despite a 12-7 penalty count in their favour. If anything, the final score flattered the home side as only two late tries spared them from being nilled. The game got off to a bad start as Ben Vernon knocked on and fell heavily, resulted in a lengthy delay. He was able to continue but his performance did seem to be affected. Fylde monopolised possession in the first 10 minutes but found the Sedgley defence a tough nut to crack. 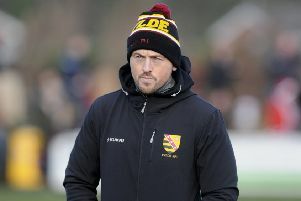 Sedgley earned their first penalty in the 11th minute and battered the home line until centre Oliver Glasse forced his way over and fly-half Steve Collins converted. Fylde made their first meaningful break when Tom Carleton scythed through, resulting in a high tackle which saw Fylde old boy Danny Maher yellow-carded. Fylde set up a driving maul from the penalty but were held up. Fylde struggled to make decisive headway, even with the extra man, while the Tigers were guided around by excellent half-backs Callum McShane and Collins, both returning to torment their former club. Collins always found willing and muscular runners, none more so than centre Matt Riley. The club stalwart’s powerful surge through the middle on 23 minutes gave Collins space to chip over for winger Richard Lepori to gather the bouncing ball and touch down. Sedgley were still a man down but Collins’ conversion left them 14-0 in front. He could have extended the lead but his 40-yard penalty following a high tackle crashed back off an upright. Henry Hadfield broke for Fylde and scrum-half Gus Warr had a chance to go for the line, though he lost the ball in a two-man tackle as the half drew to a close. Fylde needed the next score but Sedgley controlled the ball from the kick-off in the second half, making the hard yards until Ben Black crashed over and Collins goaled for 21-0. Sedgley knocked on at the restart but Fylde could not take advantage of this or two further penalties before speaking out of turn to the referee and allowing the visitors to escape their danger zone. Head coach Warren Spragg made changes as James Torkington showed an appetite for work and Crampton looked to add urgency and direction to Fylde’s attack. Unfortunately the errors continued and an unstoppable scrum shoved Fylde over their line, resulting in a bonus-point try by replacement Hallam Chapman, Collins’ conversion making it 28-0. As Sedgley realised the game looked safe, they made changes and their intensity dropped slightly. Ewan Ashman forced a turnover to pave the way for Sam Dugdale to finally get Fylde on the board at 28-5, though the conversion was missed. Two further penalties gave Fylde possession in the opposition red zone and Dugdale’s good drive saw the ball spun wide for the unopposed Ashman to stroll in for a try, the Sedgley defence switching off for the only time all game. Greg Smith’s conversion completed the scoring. Replacement Tom Forster made a nice break but Fylde could not make further inroads, though Sedgely ended the game with 14 men after Collins was harshly sin-binned for preventing a quick Fylde penalty. This young Fylde squad did remarkably well to put themselves in serious promotion contention but for the season to fizzle out as it has is tough to take. Fylde have now slipped below Tynedale into sixth place and at best can climb to fifth by winning their final game a week on Saturday at Otley, who are also on a four-match losing streak. A further defeat could mean Fylde finishing below Preston Grasshoppers and as low as eighth. Coach Spragg will look to focus his squad to produce one last performance worthy of the way they have played for the majority of the season. Hull Ionians and Chester will finish in the top two positions, with the runners-up facing a promotion play-off at Canterbury.